Louisa Gibson's as eager to settle down as any other 24-year-old LDS girl. The problem is finding a guy who wants the same thing. Which isn't easy in a place like Huntington Beach, California, where the surfer vibe's so mellow that even the most eligible Mormon bachelors don't waste their energy on anything as stressful as dating. Hanging out in groups of friends is the easier, low-pressure alternative. Lou's sick of this too-casual attitude toward soul mate searching—and she's going to do something about it. She's got a plan that will not only get her new marketing firm off the ground, but also bring back the lost art of dating, something that's going to make a whole lot of single girls very, very happy. Lou's put everything she's got into producing The Mormon Bachelor, a reality dating web series that will do what the popular t.v. show does—Latter-day Saint style. If her girlfriends' enthusiasm for the project is any indication, the thing will go viral in no time. At least that's what Lou's praying will happen; otherwise, she'll be living in her Audi. When the star of Lou's show bails on her at the last minute, she panics. In desperation, she turns to Nick Westman, the drop-dead gorgeous actor who also happens to be the most shallow man on the planet. And her ex-boyfriend. With Nick as the Mormon Bachelor, the series will be a guaranteed hit, bringing Lou's marketing firm the attention it needs for a profitable launch. Everything's turning out perfectly—until Lou's forced to become a contestant on her own show. She already knows Nick Westman is Mr. Wrong, so why does he suddenly feel so right? And how can she even think such a thing when the success of her big project depends on him finding love with someone else? With everything riding on her roller coaster feelings, Lou's got to get a grip. And fast. I rarely watch t.v. and when I do indulge, you better believe it's not in "reality" romance shows a lá The Bachelor (I prefer more sophisticated programming—you know, like Hoarders). So, when I read the plot summary for Melanie Jacobson's newest LDS romance, I hesitated. But only for a second. It's Jacobson, after all, and when I said I'd read anything she wrote, I meant it. Even if it's The Bachelor in print (gag). And guess what? Second Chances proved worthy of my trust. The novel's vintage Jacobson—in other words, upbeat, funny and heart-meltingly (yes, of course, that's a real word) romantic. I'm not always wild about Jacobson's I'm-beautiful-and-I-know-it heroines (because, after all, there's a very fine line between confident and cocky), but I liked Lou enough to root for her triumph, both professionally and romantically. Is our girl victorious? I'm not going to tell you (although you can probably figure it out for yourself), I'm just going to guarantee that you'll enjoy the ride. I always do when Jacobson's at the wheel. To the FTC, with love: I bought a copy of Second Chances from Amazon with a portion of the millions I make from my lucrative career as a book blogger. Ha ha. It's okay if you totally skipped over my review so you could get down here, to the good part. I'll forgive you. 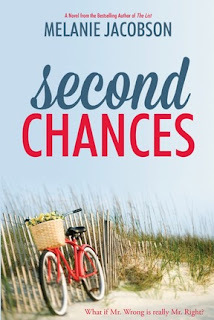 I'll also make this super easy on you: If you'd like a chance to win a copy of Second Chances for your very own, leave a comment on this post telling me you want to enter. You must also leave a valid e-mail address so that I can contact you if you win. The contest will end on April 30th. Good luck! Great review - thanks for posting and now I would love to read this book. Please enter me in the drawing. Great review - you sold me and I am a sucker for a good romance. I would like to read this book, please enter me in the drawing. I would love to enter - thanks for making it easy! I have loved all of Melanie's previous books and can't wait for this one! Thanks for your review! I've yet to read any of Jacobson's books, and i'm always up for a good clean romantic adventure. Enter me in to Win! I love her books and I would absolutely love to read Second Chances. I just dropped by Deseret Book today and debated buying it! Darned law school budget! (: Thanks for giving such reliable/great reviews!! Ooooh this sounds fun! I haven't watched The Bachelor either but this sounds cute. Count me in! I've enjoyed most of Melanie's books and would love to snag her newest. Thanks! Love Melanie. holtmin at yahoo dot com. Hi. I would like a copy. My email address is pamelacornes@ymail.com. I'd love to enter!! Love this author!